Gold prices were extremely volatile during the Fed's press conference yesterday but still could not break the range and stayed below the $1200 level as traders were trying to understand the Fed's removal of the word “accommodative” which sent the greenback lower. Now the markets might have thought that the Fed has come to an end with the tightening policy, but despite Powell's bearish tone, the Fed is still considering rate hikes if needed all depending on inflation. Any US figure that will not meet the expectations will weaken further the Dollar and will give Gold a little push to the upside to break above the $1200 level. 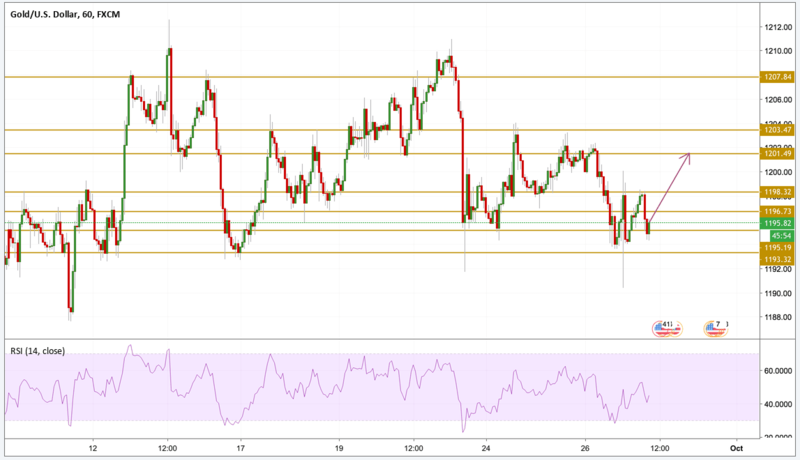 Gold prices still could not break above the $1200 level but it started picking up some bullish momentum after the RSI printed below the 30 level pointing towards oversold conditions. The price has a lot of resistance level to break on its way up but the main level we will be focusing on is the $1201.5 level.